A couple of weeks ago I received a diagnosis that changed my life for the better. You see, for years I’ve struggled with chronic pain in my side and abdomen, pain that I was told was just part of being a woman, and pain that I tried to forget about with prescription strength pain medicine. And as weird as it sounds, I’d kind of just accepted that this was my life. I became an expert on pain management and even on the really bad days, the doubled over days, I’d remind myself that the doctors deemed it “normal” and not to make a big fuss over it. Well as it turns out, this kind of pain is not in fact normal. It’s caused by a disease known as Endometriosis and aided by the large benign mass they found growing in my abdomen. And while the past few weeks have been a blur, I can't help but feel relieved to have answers and to begin my healing journey. So what does all this have to do with food? Well, absolutely everything. There is no cure for Endometriosis. But there is immense hope and healing to be found through diet and holistic lifestyle changes. And this hope and healing isn’t just for me. It’s for you, too. It’s for anyone suffering from chronic illness, depression, anxiety, infertility, digestive issues and more. And for anyone who just wants to feel better, have more energy and eat a diet rich in whole foods. I know I’m not alone on this journey, and my hope is that the recipes and healing techniques coming to the blog might inspire your own path to wellness! Because if there’s one thing I know to be true, it’s that food is a miraculous healer and it’s given to us for a reason. Going forward, you can still expect the same dose of delicious recipes! They’ll just be created with the intent to reduce inflammation and support healing. This means lots of seasonal, plant-based recipes and healthy alternatives to recipes that would typically include gluten, dairy or refined sugars. Now without further ado, please allow me to introduce you to my new favorite lunch! This Sesame Ginger Salmon Bowl is built on a bed of riced cauliflower and topped with the kitchen sink of Thai-inspired ingredients. I like to use a mixture of raw and cooked veggies and herbs, like fresh radish, purple cabbage, mint, julienned carrots, edamame, snap peas, pickled ginger and avocado, but you can certainly throw in whatever you have on hand! You can also use brown rice in place of cauliflower rice if you’re eating grains and black sesame seeds are a nice touch either way! The trick is tying it all together with this flavor-packed Sesame Ginger sauce! Not only do I love this meal because it’s fresh, healthy and flavorful, but it’s a simple way to incorporate Omega-3 rich Salmon into your diet. As you may already know, Salmon is King when it comes to reducing inflammation, but sourcing high quality salmon can be tricky when you’re landlocked like me. Luckily you can order it online from one of my favorite sources, Greensbury Market. Their Alaskan Sockeye Salmon is wild-caught, sustainably sourced and incredibly delicious! And if you want to give them a try, you can use code FEASTANDFABLE10 for 10% off your first order! I hope you enjoy this recipe and I thank you for letting me share my story! Thank you to Greensbury Market for providing the delicious salmon for this recipe! Prepare the Sesame Ginger sauce. Place the toasted sesame oil, coconut aminos, ginger, garlic, rice wine vinegar, honey and black pepper in a bowl. Whisk to combine and set aside. Next, prepare the cauliflower rice. Remove the stem and quarter or chop the cauliflower until it can fit into the bowl of a food processor. Pulse the food processor until the cauliflower is the size of rice. Set aside. Prepare the veggies, herbs and toppings. Chop the raw vegetables, such as radish, carrot, avocado and mint or basil. Cook any ingredients that need to be blanched or boiled such as edamame and snap peas. I find purple cabbage is delicious when sautéed in a bit of ghee or coconut oil, but it’s just as tasty raw. Set the prepared veggies aside. Cook the cauliflower rice. In a large skillet, place 2 Tbsp coconut oil and let melt over medium high heat. Once heated through, add the cauliflower rice with a few pinches of salt and pepper. Stir to coat the rice and turn the heat down to medium. Let cook until the cauliflower is softened and cooked throughout. You can begin preparing the salmon while the rice cooks, and once it’s done, simply cover it with a lid and take it off the burner. To prepare the salmon, give each fillet a pinch of salt and pepper. Cook on the grill, or follow this method: Heat 1-2 Tbsp. coconut oil in a cast iron skillet over medium high heat. Once it’s nice and hot, place the salmon fillets in the skillet flesh side down. Let them sizzle away for about 2 minutes undisturbed, then place the skillet in an oven preheated to 400 degrees F. and cook for about 3-6 minutes depending on the thickness of the fillet. Once they’re cooked, carefully remove the skillet from the oven and use tongs to gently lift them out. The skin will peel off easily in one piece! Lastly, assemble the bowls. Place a big heap of the cauliflower rice in a bowl. Spoon a teaspoon or two of the sauce over the rice, then add in your veggies. Top with salmon, black sesame seeds and drizzle with more of the sauce. Then, enjoy! Years ago, when friends and family would visit with us in Nashville, it always meant a trip down to Broadway for live music, a quick stop by the Parthenon and maybe a visit to the modest, but sought-after Loveless Cafe for some warm, flaky biscuits. But today, that itinerary - and Nashville itself - looks quite a bit different. There’s dozens of new and hip restaurants to choose from, locally owned breweries to visit, new neighborhoods to walk through with trendy rooftop lounges, art galleries and cafes. At times it feels more like a Brooklyn Borough than a city of the South, attracting an onslaught of tourists, artists and celebrities. But somewhere beneath the Instagrammable wall murals and the cupcake vending machines, we have Hot Chicken to keep us grounded. And every real Nashvillian knows you can't have Hot Chicken without Pimento Mac-N-Cheese. 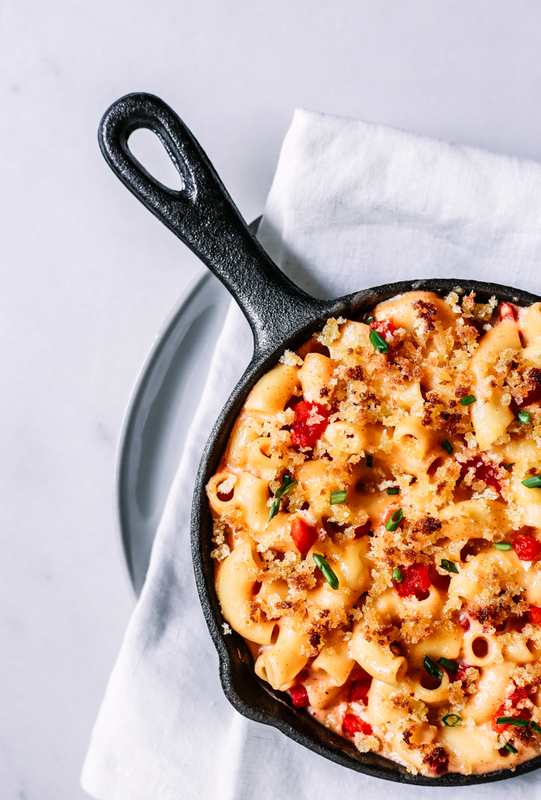 This recipe for Pimento Mac-N-Cheese is inspired by our favorite Hot Chicken restaurant in town, Hattie B’s. It’s part an homage to the city’s Southern roots and part an early birthday present for my husband. Because no one loves Mac more than him! 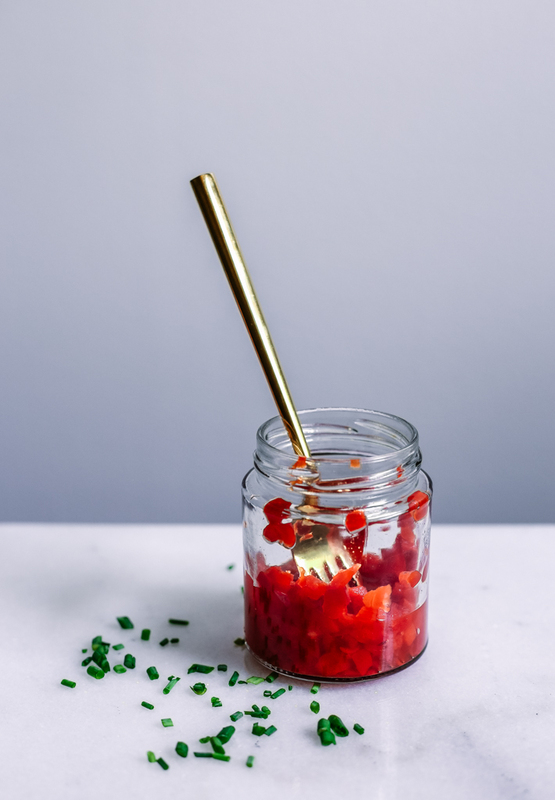 The dish gets its signature, subtle spice from sweet pimento peppers and a hint of smoked paprika. Combined with 2 heaping cups of Tillamook’s Extra Sharp Cheddar Cheese, it’s the perfect cheese to noodle ratio and needless to say, it's packed with flavor! I like to use large elbow macaroni noodles for this recipe (but any kind will do!) and top it off with a few toasty breadcrumbs for added texture. You can serve it up in one large dish or in several mini skillets - either way, it will be delicious! Special thanks to Tillamook for sponsoring this post! Preheat the oven to 350 degrees F. Cook the macaroni, drain and set aside. While the macaroni cooks, grate the cheese and set aside. In a large sauce pan, combine the milk, red pepper flakes, smoked paprika, salt and black pepper. Bring to a simmer, not a boil, and stir occasionally. While the milk mixture comes to a simmer, melt your butter in a small saucepan. Using a whisk, slowly add in the flour, whisking all the while to prevent clumps from forming. Continue whisking until all the flour has been incorporated, about 3-4 minutes. Then, remove from the heat. Once the milk mixture is simmering, add in the butter mixture and stir until smooth and thickened, about 4-5 minutes. Once thickened, remove from the heat. Add in your grated cheese and pimentos and stir to combine and melt the cheese. Then, add in the macaroni noodles, stir to combine and spoon into your dish or dishes. Cover with foil and bake for 35-40 minutes. While the macaroni bakes, toss the bread crumbs with the olive oil in a bowl and set aside. Once baked, remove the foil, give it a stir and sprinkle with the bread crumbs and an additional sprinkle of cheese if you desire. Then, return to the oven and bake until the bread crumbs have started to brown. Alternatively, you can place under a low broiler to brown quicker. Remove from the oven, garnish with chopped chives and enjoy! It’s Peach season. It’s grilling season. It’s dress weather. And I’m happy. Even though I made the mistake of learning how to grill last summer and even though it’s already 90 degrees outside. I say mistake, because grilling season used to be like a mini-vacation for this gal. I’d prepare a simple summer side or two and then kick my feet up while my husband did all the heavy lifting. And it felt like staying at the Four Seasons, only better. Until one day, I got the bright idea to learn how to do it myself. And I felt all excited and empowered, until I realized what I’d done. Like when your parents teach you how to do your own laundry and you realize you’ve been duped. But in all honesty, I still love this season of cooking. I love the simple flavors of summer and the crunchy char marks of the grill. I love the way it invites you to eat al fresco and maybe pour another glass of wine. I love clipping fresh basil and dousing everything with lemon and how light, healthy and refreshing it all feels. And I definitely love this recipe for Peach Caprese Grilled Chicken! The idea for this recipe came to me after my friends at Greensbury Market sent me a shipment of their organic, free-range chicken breasts to try. 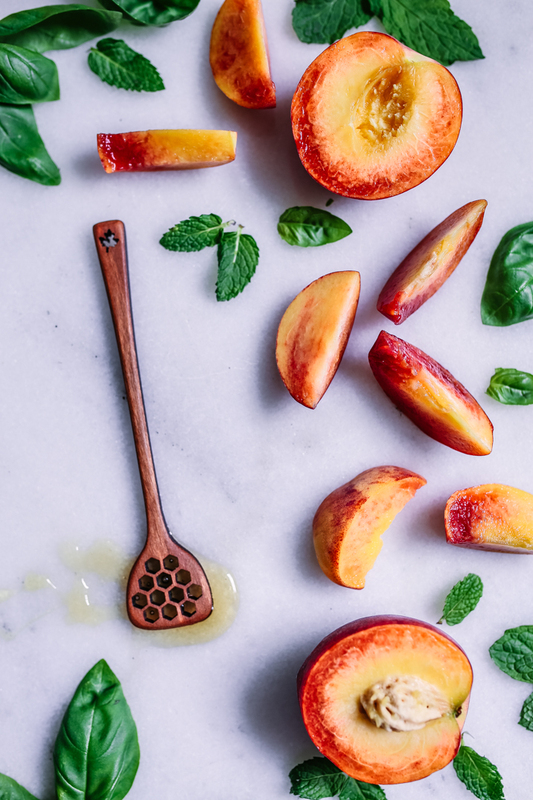 I knew I wanted to create a flavorful marinade, infused with flavors of basil and balsamic, and then I remembered that everything tastes better with peaches on it, in it, atop it (insert preposition here). To serve, simply plate the chicken, top with spoonfuls of the fresh, chopped peaches and garnish with chopped fresh basil and mint. Drizzle with a healthy dose of balsamic glaze and enjoy! There’s nothing quite like early summer in Tennessee. It’s a brief, but blissful time, when mornings are cool and damp, and evening storms bring pink, pastel skies. Every inch of the earth becomes cloaked in green, and once known paths become unruly beds for tall grasses, wildflowers and engorged bushes. And somewhere underneath all this overgrowth, deep in the belly of the forest, a bass line of crickets, bees and insects hum in perfect cadence. It’s the pulse of summer, giving rhythm to the squawks and squeals of the birds, and reminding us just how good it is to be alive. And it’s during this time that fresh, local strawberries are ripe for the picking. Delicate, juicy and brimming with flavor, these sweet summer berries are nothing like what you find in the stores year round. They’re ruby red and almost purple, pocked with the tiniest of seeds, their flesh tasting of candy. Born from thick, but sightly bushes, strawberries like to hide beneath a canopy of lime green leaves, staying cool and hidden from the sun. Picking them is admittedly more taxing, requiring awkward angles and knees in the dirt. But the juice is worth the squeeze so to speak, because there’s nothing like pulling back a sea of leaves to find a cluster of beautiful, red berries before you. In Nashville, I like to pick my strawberries at Green Door Gourmet. 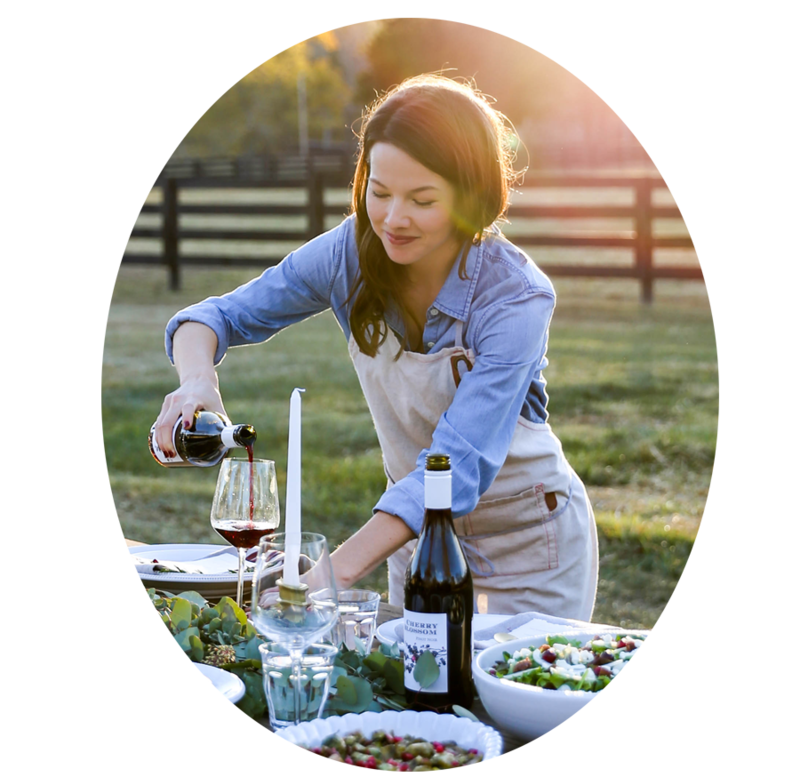 Set on 350 acres of rolling Tennessee land, they are a beautiful, organic farm that yields impressive, flavorful produce. It’s always a peaceful and pleasant experience and it certainly helps that the farm is run by some wonderful, passionate people! My friend Richard is the Farm Chef at Green Door Gourmet and he’s been kind enough to share his delicious recipe for Strawberry Clafoutis with us. Richard is the kind of chef that’s always chasing those rare and seasonal ingredients you can only find in the wild. I’m always learning something new from his dishes, and I love how he takes the concept of farm to table and pairs it with the kind of elegance you find in French cooking. If you’ve never had a Clafoutis, it’s a classic French dessert that consists of a fluffy, custard-like filling that’s studded with fresh fruit like cherries or strawberries. It’s incredibly simple to make, and can be served in one large baking dish or skillet, or several mini ramekins or skillets. Just don’t forget to top it with ice cream and strawberry sauce! I hope this recipe inspires you to pick your own strawberries this season and to share this delicious Strawberry Clafoutis with friends and family. As always, enjoy!! 1.) Preheat oven to 365 degrees F. Gently wash and dry the strawberries. Then, cut large strawberries into quarters and medium strawberries in half (eat the small ones!). 2.) Toss the strawberries lightly with sifted cornstarch and divide between 4 ramekins (or 8, 3.5 inch mini-skillets). Then, whisk together the eggs, milk, flour, sugar, vanilla and salt. Pour over the strawberries and bake until partially golden-brown and slightly puffed up, 25-30 minutes (or 16- 20 minutes if using mini skillets). Serve with a garnish of sifted powdered sugar, ice cream and strawberry sauce! Enjoy! I can remember the first meal I prepared for my mother. It was a simple recipe of scrambled eggs with diced tomatoes and one that I found in my favorite recipe book for kids. I was probably eight or nine years old at the time, tall enough to reach the stove and old enough to know how to use it. And while I can’t recall if this particular morning was in celebration of Mother’s Day or just an average Sunday, I do recall waking up early to get started because more than anything, I wanted her to be surprised. I’ll never forget the way I felt when she walked into the kitchen, wrapped in her favorite blue robe, wearing a sleepy smile on her face. I sat her down at the end of the kitchen table with a cup of cold cranberry juice and insisted she stay there as I finished preparing her breakfast. Once plated, I carefully brought the eggs to her - swimming in tomato juices and likely shy of salt - and all I can remember is how happy I felt to have made this food and how badly I wanted her to like it. Twenty years later, and I still love making food for others, especially when it’s a surprise. And I have a feeling you do to. So I created a recipe with Mother’s Day in mind that’s incredibly delicious, healthy and so simple, even the kids can help make it. 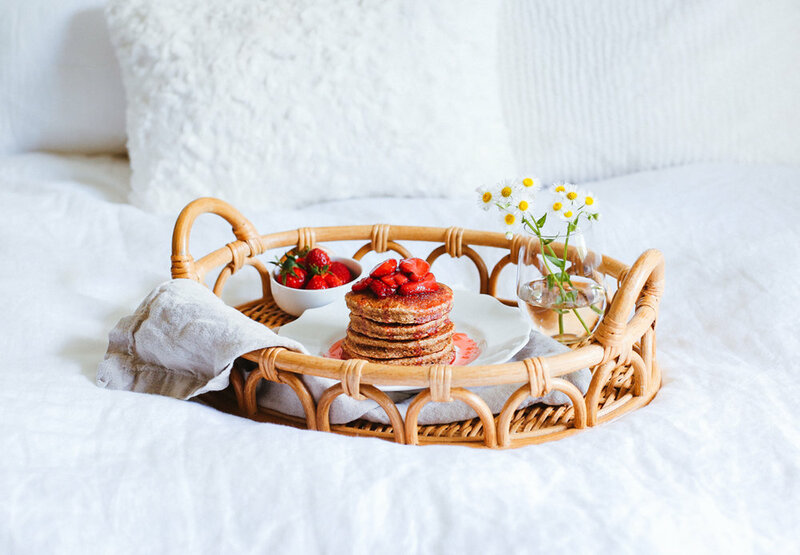 This recipe for Banana Oat Pancakes comes topped with fresh, pan-roasted strawberries and is free of gluten, dairy (except for eggs) and refined sugars. It whips up quick, has a fluffy, flavorful texture and leaves you feeling oh so satisfied. And while these pancakes are special enough on their own, I say go the extra mile. Place a stack on a tray next to a pitcher of maple syrup, some freshly picked wildflowers from the yard and a handwritten note or two. If you have children, ask them to help! They will love stirring the batter, cracking the eggs and helping to pick the flowers. 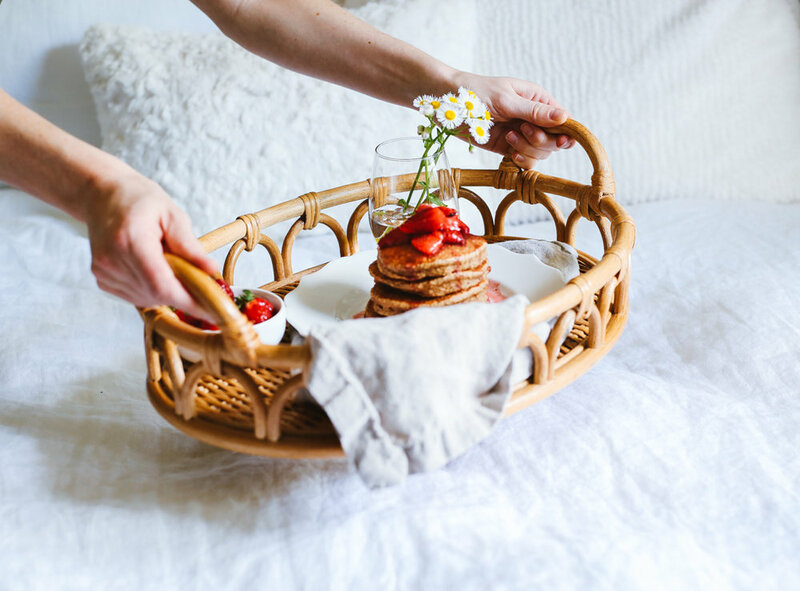 I promise you, nothing will make mom feel more loved than being surprised with a homemade breakfast in bed (especially one that’s healthy!). I’m so grateful for all you mamas out there! You have the hardest and most important job in the world and I wish you mountains of pancakes on your special day! Place a sheet pan in the oven and preheat to 200 degrees F.
Next, make the oat flour. Place 2 cups of rolled oats (not quick cooking oats) in a food processor and process into a fine powder. Then, place the flour into a bowl and add in the baking powder, cinnamon and salt. Stir to combine and set aside. In a blender, place the coconut milk, banana, vanilla extract, vegetable oil and maple syrup. Blend until smooth. Then, add in 2 eggs and 1 egg white and blend quickly until incorporated, being mindful not to over mix. Pour the liquid into the flour mixture and stir until just combined. Let set to thicken while you heat your pan or griddle over medium heat. While the griddle heats, prepare the roasted strawberries. Place the sliced strawberries in a skillet and toss with 1-2 Tbsp. of maple syrup. Cook over medium heat, stirring occasionally. The skillet should be hot enough to help the strawberries release their juices, but not so hot that the juices burn or evaporate. Feel free to turn down the heat to medium low once they start to get juicy. Lastly, make the pancakes. Give the batter another stir and place 1/4 cup of batter onto the center of the skillet or griddle. Allow to cook until the edges become slightly dull and any bubbles that have surfaced pop. Flip, and let cook for 1-2 minutes or until the center feels done. Once cooked, place the pancake on the baking sheet in the oven to stay warm and finish making the rest of your pancakes. If you want a thinner batter, add 1 - 2 Tbsp. more of coconut milk. To serve, place a stack of pancakes on a plate and scoop the roasted strawberries overtop. Then, drizzle with a bit of maple syrup and enjoy!